Southwest Airlines (Dallas) has added additional nonstop service options between Boston and Minneapolis/St. Paul and between Philadelphia and Minneapolis/St. Paul for football fans traveling to and from the Super Bowl. Copyright Photo: Southwest Airlines Boeing 737-7H4 WL N744SW (msn 29490) SNA (Michael B. Ing). Image: 939564. 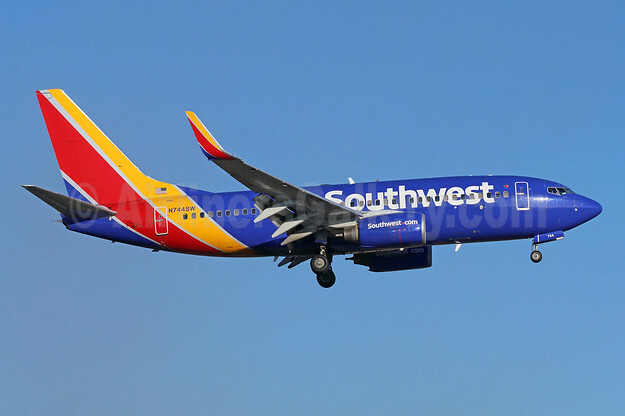 This entry was posted in Southwest Airlines and tagged Boeing 737-7H4 WL, msn 29490, N744SW, Southwest Airlines on January 23, 2018 by Bruce Drum.